If you like figs, you may also enjoy fig jam. Making jam is a great way to preserve your figs and share them with friends. This page contains fig jam recipes. My family is trying to limit their refined sugar intake, and I have been experimenting with different products. Found one that I used in making fig preserves, and it tastes just like what my Mom used to make when she used sugar. Very simple recipe. Wash figs, then mash them and put in a container. I use a big square plastic container. Pour the bottle of Agave Nectar over the figs and let them sit overnight. Next morning, put in a pot and cook down just like you would any kind of preserves to get the water out. Put in jars, cap with lids, then water bath them. They are excellent. Enjoy. 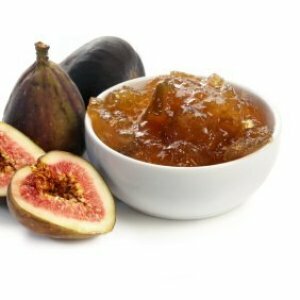 Does anyone have an easy fig jam recipe, that can be frozen, instead of going through the canning process? Or is there any other way to cook and freeze fig jam to use it at a later date? To freeze figs wash and peel figs. You can put them into freezer bags filling all spaces.Seal label and freeze. You can also leave your figs whole or cut in half. Combine 1 part sugar to 4 part figs. Put in freezer bags ,label and freeze. Why not try canning it? It sounds like you know how to make jam. You do need canning jars, but they are readily available this time of year in grocery stores. You don't need a special canning pot for the canning, just use a normal big pot or kettle that you already have. Put the full jars in, then make sure the boiling water covers the tops of the jars by about a inch. Once it starts boiling again, just set the timer for the amount of time the recipe inside the pectin box says you need. It is really easy and the small canning jam jars are really pretty. I'm almost sure you can I freeze all my fig preserves. They are very good, put in ziplock bags, good luck.